Matt Schick, Ivan Maisel, Adam Rittenberg & Brad Edwards recap every angle of Clemson's dominant win over Alabama. Plus, Walk-Ons (48:21) & Extra Points (57:57). Peter Burns, Adam Rittenberg & Brad Edwards break down every angle of the National Championship and welcome Phil Steele for his final impressions of the 2018 season (30:55). Plus, Walk-Ons (42:46) and Extra Points (54:12). Ivan Maisel and Adam Rittenberg discuss the College Football Playoff Semifinal matchups and the potential suspensions that may define them (8:15), in addition to the rest of the "New Year's Six" (16:48). Plus, Urban Meyer gets a new gig in Columbus (20:49), Phil Steele offers his picks (29:20) and the guys answer Walk-Ons (44:11) as well as give their Extra Points (52:13). Peter Burns, Adam Rittenberg & Brad Edwards share their thoughts on the early signing period (2:42), weigh in on the failed UF/UCF negotiations (16:38) & more. Plus, Phil Steele's picks (27:51), Walk-Ons (42:20) & Extra Points (52:38). Ivan Maisel and Ryan McGee remember those that were lost over the past year in the world of college football. Ivan Maisel, Brad Edwards & Jake Trotter, discuss the start of bowl season (3:46), weigh in on the significance of Oregon landing the top recruit in the country (8:16), debate which coach is most worthy of COY honors (17:44) & more. Plus, Walk-Ons (30:16) and Extra Points (37:40). Check out this old episode featuring Ivan & Beano referenced at the end of Walk-On-A-Palooza. Originally published 1/5/2010. Thanks to Robert Magette for finding it. Ivan Maisel, Brad Edwards, Adam Rittenberg & Ryan McGee answer the best remaining Walk-Ons questions from the file on a variety of topics around the game. Ryan McGee, Brad Edwards & Heather Dinich weigh in on Urban Meyer's decision to leave Ohio State (1:54), debate Meyer's legacy (9:00), wonder if he'll ever coach again (20:40) and more. Plus, they discuss the Heisman finalists (26:45), answer Walk-On questions (33:04) and kick their Extra Points (43:08). Rece Davis, Kirk Herbstreit, Jesse Palmer, Joey Galloway and David Pollack reveal the field for the College Football Playoff and debate if the Committee got it right. Ben and Peter review Rivalry Weekend in CFB in their own unique way. Matt Schick, Adam Rittenberg & Brad Edwards discuss the latest CFP rankings (1:30), The Game (14:27), West Virginia's chances (21:50) and more. Plus, Phil Steele (42:47), Walk-Ons (57:32) and Extra Points (1:04:40). Ivan Maisel, Chris Low & Ryan McGee discuss the pleasant surprise of Ed Oliver returning to the field (3:32), varying degrees of trash talk at Texas and Michigan (7:40), awards races (17:26) and more. Plus, Walk-Ons (29:40) and Extra Points (39:16). Did Alabama set themselves back by playing a cupcake like The Citadel? Should Urban Meyer remain at OSU after this year? Heather Dinich breaks down CFP scenarios. Peter Burns, Adam Rittenberg & Jake Trotter discuss Ed Oliver's emotional outburst (2:30), the cupcake schedules (13:28), coaching rumors (21:40) and more. Plus, a #Walkons question to remind us why we fell in love with CFB (33:40), Predictions (41:15) and Extra Points (46:22). Matt Schick, Ivan Maisel & Adam Rittenberg discuss the scheduling issues that led to such a weak slate (3:10), the upsets we'd love to see (12:19) and more. Plus, Fill-In-The-Blanks (23:26), Phil Steele's Picks (36:14), Talk Nerdy To Me (45:59), Walk-Ons (53:09) and Extra Points (59:28). Brad Edwards, Jake Trotter & Heather Dinich react to the stagnant CFP rankings (4:15), discuss Oklahoma's defensive deficiencies (8:00), delve into "What-If Wednesday" (22:05) and more. Plus, Walk-Ons (34:49) & Extra Points (45:26). Adam Rittenberg, Brad Edwards & Chris Low discuss the rumors swirling around Mike MacIntyre & Colorado (3:06), the impact of Tua's health (9:30), whether Bama or OU has a more potent offense (19:35), Mike Gundy's comments on transferring snowflakes (27:10) and more. Plus, Walk-Ons (34:05) and Extra Points (50:14). Peter Burns, Ryan McGee & Chris Low discuss a great finish at Bedlam (1:58), the top-10 taking care of business (7:00), Bobby Petrino getting the axe (24:40) & more. Plus, "Talk Nerdy To Me" (33:06), Walk-Ons (39:36) and Extra Points (46:47). Ben and Peter break down week 11 in CFB in their own you unique way on Best Week Ever. Ryan McGee, Chris Low & Jake Trotter discuss NC State stubbing its toe (again) (3:10), the chaos potential of Week 11 (7:40), the magnificent Kyler Murray (13:44) and more. Plus, Walk-Ons (23:07) and Extra Points (36:15). Matt Schick, Brad Edwards and Ivan Maisel discuss the CFP rankings, including Michigan entering the Top 4, which teams can better their positions and play "What If Wednesday." Plus, Walk-Ons and Extra Points. Ivan Maisel, Adam Rittenberg and Ryan McGee share their thoughts on the latest at Maryland (2:38), UCF's win from Thursday night (13:18), a partial appeal victory for Ole Miss (17:36) and Alabama-LSU (20:22). Plus, Phil Steele makes his picks (28:58) and the crew answer their Walk-Ons (40:12) as well as Extra Points (45:03). Before chatting with CFP Committee Chair Rob Mullens (17:49), Adam Rittenberg, Jake Trotter & Heather Dinich discuss the firing of DJ Durkin (2:43), debate if this weekend is the greatest CFB regular season weekend ever (13:34) and more. Plus, "Talk Nerdy To Me" (31:33), Walk-Ons (37:39) and Extra Points (44:48). Matt Schick, Peter Burns & Ryan McGee react to the initial CFP rankings (2:12), chat with Adam Rittenberg about Maryland's decision to retain D.J. Durkin (15:02) & more. Plus, Week 10 Fill In The Blanks (30:50), Walk-Ons (44:00) & Extra Points (50:08). Ivan Maisel, Brad Edwards & Chris Low discuss the shakeups on the USC staff (3:20), whether the Browns could hire a premiere CFB coach (14:25) and more. Plus, Adam Rittenberg with an update from Maryland (26:00), CFP rankings predictions (31:00), Walk-Ons (38:40) and Extra Points (47:50). Matt Schick, Ivan Maisel & Ryan McGee discuss the best (2:52) and worst (9:00) of Week 9, weigh in on UK continuing to defy the odds (15:25), Willie Taggart's damning comments (17:35) and more. Plus, Talk Nerdy To Me (29:50), Walk-Ons featuring Mike Gundy (36:36) & Extra Points (45:30). The biggest stories of CFB Week 9, including Willie Taggart calling out his players, Penn State's win over Iowa, and UGA's win. Peter Burns hates Halloween & Halloween music. Peter Burns, Ryan McGee & Chris Low welcome Adam Rittenberg to discuss the Maryland findings (1:00) before delving into the best games on the Week 9 slate (9:34). Plus, Walk-Ons (26:15) and Extra Points (34:05). Matt Schick, Ivan Maisel & Jake Trotter try to translate statements from conferences (2:10), fill in the blanks for Week 9 (11:43) & more. Plus, Phil Steele's picks (26:39), Talk Nerdy To Me (38:20), Walk-Ons (44:12) & Extra Points (51:57). Ivan Maisel, Brad Edwards & Chris Low discuss the internal strife at Ohio State (4:00), discipline for a key player at TCU (14:40) & Florida-Georgia's return to relevancy (17:56) and more. Plus, Walk-Ons (31:00) & Extra Points (40:27). Ivan Maisel, Adam Rittenberg & Brad Edwards discuss the latest from Maryland, (2:33), weigh in on the conspiracy theories surrounding the Devin White suspension (8:48), share their thoughts on the continued war of words between Michigan & Michigan State (21:13) & more. Plus, Walk-Ons (28:21) and Extra Points (37:44). Ivan Maisel, Peter Burns & Ryan McGee discuss Purdue's upset of Ohio State (4:23), Michigan's performance against Sparty (13:12), the Pac-12 puzzle (21:45) & more. Plus, "Talk Nerdy To Me" (33:00), Walk-Ons (40:01) and Extra Points (47:59). Matt Schick, Ryan McGee & Jake Trotter discuss potential Heisman shake-ups midway through the season (3:50), fill in the blanks for Week 8 (12:42) and more. Plus, Phil Steele's picks (24:16), "Talk Nerdy To Me" (37:45), Walk-Ons (43:04) & Extra Points (51:54). Matt Schick, Peter Burns & Heather Dinich discuss Tua's health (2:00), debate who was helped the most by last weekend's results (8:01), react to Nick Bosa leaving OSU (28:10), "Jump To Conclusions" (30:30) and more. Plus, "Talk Nerdy To Me" (42:48), Walk-Ons (49:19) and Extra Points (54:42). Ivan Maisel, Brad Edwards and Chris Low share their thoughts on the weekend of chaos including LSU's win over Georgia and Michigan's dominance over Wisconsin. Plus, how did Week 7 shake up the Big Ten, ACC and SEC. Also, the crew answers #WalkOns and more. Peter Burns and Ben Hartsock look back at Week 7 in college football in their unique way. Ryan McGee joins the show. Matt Schick, Ivan Maisel & Adam Rittenberg react to Texas Tech' win on Thursday (1:28), continue the discussion of concerns for top teams (22:25) and more. Plus, "Talk Nerdy To Me" (38:00), Walk-Ons (44:58) and Extra Points (52:09). Matt Schick, Ryan McGee & Brad Edwards discuss issues with Pac-12 officiating (1:50), the biggest concern for a couple of contenders (15:43) and more. Plus, they "Fill in the Blanks" for Week 7 (24:15), and chat with Phil Steele (35:12) before Walk-Ons (48:46) & Extra Points (55:41). Peter Burns, Adam Rittenberg & Chris Low channel their inner Robert Stack to discuss what we still don't know about several relevant teams this season (1:57), debate which CFB teams should be relegated EPL style (21:20) & more. Plus, Walk-Ons (32:50) & Extra Points (43:24). After putting a bow on the Stoops situation at OU (3:01), Matt Schick, Jake Trotter & Heather Dinich discuss what differentiates a quality win (9:43), weigh in on the remaining unbeatens (16:25), "Jump To Conclusions" (25:15) and more. Plus, Walk-Ons (41:07) and Extra Points (51:27). Ivan Maisel, Peter Burns & Chris Low discuss Texas' big win and the demise of Mike Stoops (2:50), Notre Dame's big win (12:20), how coaches are separating themselves (20:10) and more. Plus, "Talk Nerdy To Me" (31:27), Walk-Ons (38:50) & Extra Points (49:03). Multiple CFB teams had huge statement wins this week. Which current Top 4 teams could end up on the outside looking in? Plus, producer Mike A is building a man cave. Matt Schick, Ryan McGee & Peter Burns discuss what they're looking forward to this weekend (4:28), explain why everybody should root for Notre Dame (13:10), delve into Nick Saban's criticisms of Alabama's student section (20:00), fill in the blanks (28:16) & more. Plus, Walk-Ons (47:31) & Extra Points (56:29). Jake Trotter and Jeremy Willis talk to actor Duane Davis, who played the role of Alvin Mack in the CFB cult classic "The Program" about the film and why it's so beloved. Ivan Maisel, Chris Low & Jake Trotter discuss the latest publication of coaches' salaries (3:08), debate if Washington is flying under-the-radar (14:23) & more. Plus, Phil Steele's picks (23:44), "Talk Nerdy To Me" (36:07), the best Walk-On question of the season (41:25) and Extra Points (49:50). Ivan Maisel, Brad Edwards & Ryan McGee discuss Mike Leach's comments on offensive balance (2:58), weigh in on the positive (10:24) & negative (21:35) surprises of the 1st month and more. Plus, Walk-Ons (30:02) & Extra Points (41:57). Ivan Maisel, Adam Rittenberg & Heather Dinich discuss Trevor Lawrence's health (3:25), Nick Saban's comments on Jalen Hurts (10:45), Jimbo Fisher & Scott Frost's tempers (18:38) & more. Plus, "Talk Nerdy To Me" (28:59), Walk-Ons (35:40) & Extra Points (41:30). Brad Edwards, Heather Dinich & Chris Low discuss big wins for Ohio State (3:02) & Notre Dame (11:29), discuss what "chalk" would create for the rest of the year (17:00) & more. Plus, questions about Clemson's QB situation (23:10), Walk-Ons (33:02) and Extra Points (38:57). Ivan Maisel, Ryan McGee & Chris Low discuss Miami's easy win (3:30), discuss the stakes for Stanford/Notre Dame (5:55) & Ohio State/Penn State (14:35), wonder if LSU should be on upset alert vs. Ole Miss (19:52) and more. Plus, Walk-Ons (24:57) & Extra Points (31:30). Matt Schick, Adam Rittenberg & Peter Burns discuss the continuing fallout from Kelly Bryant's transfer (2:55), Mike Gundy's odd request at Oklahoma State (15:01) & more. Plus, "Talk Nerdy To Me" (33:19), Phil Steele's analysis of the best games of the weekend (39:18), Walk-Ons (50:58) and Extra Points (57:02). Ivan Maisel, Adam Rittenberg and Heather Dinich discuss what's at stake for Ohio State & Penn State (4:09), the big showdown in the Big 12 (15:32), issues at Oklahoma (21:35), Clemson's handling of their QB decision (24:00) and more. Plus, Walk-Ons (27:30) and Extra Points (33:12). Peter and Ben react to week 4 in College Football. Ivan Maisel, Adam Rittenberg & Ryan McGee discuss the impact of Nick Bosa's injury (3:49), the dynamics of the Auburn transfers and how it could pertain to Alabama (8:37), Nebraska's revised schedule (14:40), more fallout at Maryland (22:30) & much more. Plus, Walk-Ons (31:08) & Extra Points (39:14). Matt Schick, Ivan Maisel & Jake Trotter discuss the verbal spat between Brian Kelly & Derek Mason (2:45), the games that excite them the most in Week 4 (8:20) and more. Plus, the crew fills in the blanks (16:20), gets a dose of "Talk Nerdy To Me" (20:23), chats with Phil Steele about the best games of the week (36:04) answer walk-on questions (47:12) and give their extra points (53:29). Matt Schick, Brad Edwards & Chris Low discuss the importance of Bryce Love as Stanford prepares to take on Oregon (1:52), Chip Kelly's reaction to criticism at UCLA (7:22), how Urban Meyer will handle future critics of Ohio State (9:25) and more. Plus, the guys "Jump To Conclusions" (14:50), answer Walk-Ons (35:25) and share their Extra Points (42:46). Peter Burns, Heather Dinich & Adam Rittenberg react to Urban Meyer's press conference (1:30), explain why Ohio State is the Big 10's best hope at the CFP (12:56), whether things are worse for Florida State or UCLA (21:25) and more. Plus, Walk-Ons (31:44) and Extra Points (38:02). Ivan Maisel, Matt Schick & Chris Low discuss Urban Meyer's conversation with Tom Rinaldi (3:25), a terrible weekend for the B1G (8:10) & Pac-12 (13:52), struggles for Scott Frost (26:06) & Willie Taggart (28:24), a big win for LSU, Texas (33:26) and more. Plus, "Talk Nerdy To Me" tackles the biggest risers & fallers (39:39), Walk-Ons (44:30) & Extra Points (51:45). Matt Schick, Ivan Maisel & Ryan McGee discuss BC's win on Thursday (4:00), Week 3's biggest games (14:05) and more. Plus, Wright Thompson & John T. Edge discuss their new show "True South" (31:01), Walk-Ons (44:46) & Extra Points (53:34). Peter Burns, Adam Rittenberg & Chris Low break down TCU vs. Ohio State (2:50), discuss what's at stake for Boise State (6:33) play "Fill in the Blank" (10:13) & more. Plus, "Talk Nerdy To Me" (29:10), Phil Steele's biggest games (35:12), Walk-Ons (45:07) & Extra Points (53:47). Ivan Maisel, Brad Edwards and Jake Trotter get you caught up on Hurricane-related changes to matchups for this week (3:24), discuss Bryce Love's waning Heisman candidacy (9:00), Forbes listing Texas A&M as the most "valuable" college football brand (13:43) and more. Plus, Walk-Ons (29:05) and Extra Points (35:55). Ivan Maisel, Adam Rittenberg & Brad Edwards discuss the weather wreaking havoc in Week 3 (2:30), Nick Saban's plea to his squad (9:08), a crucial Week in the Big 12 (14:43) and more. Plus, Walk-Ons (28:40) & Extra Points (37:08). Peter and Ben do a little Sunday Morning therapy and react to the big Kentucky win with Matt Jones. Plus, the Greatest Game of the Week EVER! After remembering Burt Reynolds (3:47), Peter Burns, Ryan McGee & Matt Schick discuss the most intriguing games in Week 2 (7:17) and more. Plus, Walk-Ons (30:03) & Extra Points (41:43). Matt Schick, Adam Rittenberg & Jake Trotter discuss Willie Taggart's criticism's of Virginia Tech (2:58) & more before playing Week 2 fill-in-the-blank (6:53). Plus, "Talk Nerdy To Me" tackles the highest impact games of the week (24:47), Phil Steele makes his picks (29:17), Walk-ons (37:40) & Extra Points (45:00). Brad Edwards, Heather Dinich & Chris Low react to the latest AP Poll (4:55) & reassess their early predictions for OU (7:30), Washington (11:02), the ACC (16:59), Big Ten (21:34) and Notre Dame (25:15) with what they know now. Plus, walk-ons (29:12) and Extra Points (34:53). Ivan Maisel, Adam Rittenberg & Ryan McGee discuss a brutal loss for FSU (4:50), the sudden influx of SEC QBs (7:39), another reality check for Miami (14:10), Auburn's big win over Washington (16:04), Bryce Love's Heisman stumble (23:35) and more. Plus, Walk-Ons (28:16) and Extra Points (35:50). Ryan McGee, Peter Burns & Chris Low discuss another statement by Urban Meyer (5:20), UCLA's QB decision (9:26), the under-the-radar games of Week 1 (28:00) & more. Plus, Walk-Ons (34:40) and some unconventional Extra Points (41:06). Matt Schick, Adam Rittenberg and Jake Trotter breakdown Zach Smith's recent break of silence, Bobby Petrino and Louisville's season opener against Bama and more. Plus, Phil Steele makes picks and "Talk Nerdy To Me" with Brad Edwards. Ivan Maisel, Brad Edwards & Jake Trotter discuss Tom Herman's embarrassment (1:20), the QB impacts at Michigan and Notre Dame (7:10), the programs that could bounce back this season (14:10), the Alabama QB battle's impact on the Heisman front-runners (20:43) and more. Plus, Walk-Ons (28:35) and Extra Points (38:43). Ivan Maisel, Matt Schick & Heather Dinich recap Week 0 (2:15), discuss another apology by Urban Meyer (5:46), weigh in on the trend of true freshmen starting at QB (11:37), debate conference supremacy (18:42) and more. Plus, Walk-Ons (26:02) and Extra Points (32:13). Ivan Maisel, Heather Dinich & Adam Rittenberg discuss Urban Meyer's suspension, react to the Buckeyes' press conference and more (2:36). Plus, they discuss potential issues at Texas A&M (24:35), the initial AP poll (32:23) and answer "Walk-Ons" questions (34:42). Ivan Maisel, Matt Schick & Jake Trotter welcome Heather Dinich to discuss the latest surrounding Maryland (1:27). Plus, thoughts on the various QB battles around the country (21:45) and more. Before chatting with Stanford's David Shaw (28:11), Ivan Maisel, Adam Rittenberg & Heather Dinich discuss the latest at Ohio State (2:47), discipline for UNC (19:13), Jalen Hurts' interesting comments about his status at Alabama (23:06) and more. In addition to catching up with Clemson's Dabo Swinney (9:53) & Alabama's Nick Saban (23:03), Ivan Maisel & Chris Low discuss coaching changes at Ohio State, Larry Fedora's CTE comments and more. Ivan Maisel, Adam Rittenberg & Ryan McGee discuss the evolution of eligibility rules (1:58), Tyler Hilinski's CTE diagnosis (15:10), John Ward's legacy (26:21) & much more. Ivan Maisel, Heather Dinich & Chris Low discuss the legacies of Mike Slive & Billy Cannon (3:08), gambling's impact on the sport (17:00), the transfers that will shape the 2018 season (26:08), the Alabama/UCF beef (45:35) and more. Matt Schick, Adam Rittenberg & Jake Trotter discuss the Alabama QB battle (2:34), Jeremy Pruitt's tough talk at Tennessee (12:19) and more. Plus, a rapid-fire look at the squads with the most intriguing spring story lines (15:30). Peter Burns, Adam Rittenberg and Chris Low discuss spring action, observations from Penn State (10:38), Ohio State (12:45), Alabama (18:10), Clemson (23:28), Georgia (28:38) and more. Jeff Goodman, Jeff Borzello and Rob Dauster react to Villanova's dominant win (3:30), discuss their takeaways from the season (15:50), look ahead to next year (30:59) & more. Plus, the last installment of "Talk Nerdy To Me" with Seth Walder & Paul Sabin (22:20). Jeff Goodman and Jay Williams break down Loyola's run, Villanova's excellence and all things Final Four (2:14). Plus, K vs. Cal (34:34) and a Final Four edition of "Talk Nerdy To Me" (28:31). Jeff Goodman & Rece Davis look back on a crazy first weekend of the Tournament (1:08), look ahead to the regional semis (23:16), examine some coaching moves (31:52) and more. Plus, "Talk Nerdy To Me" shares analytical perspectives on what to expect moving forward (26:35). Jeff Goodman and Scott Van Pelt discuss the teams who got left out of the tourney (7:30), if UK has legit seeding beef (16:00), the best games of the first weekend (30:56), Final Four predictions (38:20) and more. Plus, "Talk Nerdy To Me" tackles the B1G's tournament profile (24:13). Jeff Goodman and Jeff Borzello discuss which teams have the most to gain & lose in Championship Week, whether Michael Porter should try to play, the beginning of the coaching carousel and much more. Plus, "Talk Nerdy To Me" examines tournament projections. Ivan Maisel, Adam Rittenberg and Jake Trotter weigh in on the latest coaching news (5:02), discuss some burning QB questions (19:30) and more. Plus, Seth Walder stops by to weigh in on preseason FPI (27:49). Jeff Goodman talks to Jay Bilas about the current state of the NCAA (2:07), Coach K beating Coach Cal at his own game (5:52), POY & COY frontrunners (19:49) and more. Plus, Bobby & Dan Hurley (37:01) and "Talk Nerdy To Me" on Xavier's chances to get a No. 1 seed (32:01). Matt Schick, Tom Luginbill and Tom VanHaaren recap National Signing Day including Georgia's great day (2:28), the rest of the top classes (16:02), Jacob Copeland's eventful commitment to Florida (44:07) and much more. Before a conversation with Xavier coach Chris Mack (34:04), Jeff Goodman talks to Sean Farnham about the strength of the SEC, the Pac-12's down year and more (:58). Plus, "Talk Nerdy To Me" (27:31) and Jeff's thoughts on Duke/UNC (49:29). Before a conversation with Ohio State student assistant Greg Oden (25:16), Jeff Goodman talks to Jay Williams about the biggest story lines in the sport so far this year, the time he got chewed out by Mike Krzyzewski and more (1:00). Plus "Talk Nerdy To Me" examines the most overrated and underrated teams according to the metrics (20:22). Ivan Maisel, Chris Low and Jake Trotter discuss Nick Saban's legacy (3:03), whether this was the best CFP ever (16:10), UGA's future (25:47), the too early top-25 (33:00) and much more. Matt Schick, Adam Rittenberg and Brad Edwards discuss Alabama's thrilling win over Georgia, the emergence of Tua Tagovailoa and much more. Ivan Maisel, Matt Schick and Adam Rittenberg discuss the National Championship matchup (2:30), UCF's title claim (29:36), Dave Aranda's new contract (39:10) and more. Ryan McGee, Heather Dinich and Brad Edwards discuss Georgia's thrilling win over OU (2:46), Alabama's thumping of Clemson (26:16), UCF's statement (33:53) and much more. Ivan Maisel and Adam Rittenberg recap some bowl games, discuss the news that LSU is parting ways with OC Matt Canada and look ahead to the rest of the bowls this weekend, including the NY6. Plus, another edition of "Talk Nerdy To Me" with Brad Edwards giving you a look at the numbers behind the semi-final matchups. Adam Rittenberg and Chris Low look back on Fresno State's win in the Hawaii Bowl and Army getting to 10 wins on the season. Plus, they share their thoughts on Josh Rosen's comments about sitting out bowl games, the future of Bill Snyder and more. Matt Schick, Tom Luginbill and Tom VanHaaren break down the first early signing period and discuss which schools took advantage, and which ones left something to be desired. Ivan Maisel, Brad Edwards and Heather Dinich discuss day 1 of the early signing period (3:30), the recruiting dust-up between Dabo Swinney and Urban Meyer (15:16) and more. Plus, Phil Steele breaks down the pre-Christmas bowl games (26:04). Ivan Maisel, Matt Schick and Jake Trotter discuss drama surrounding the early signing period (5:10), Lane Kiffin's statement at FAU (11:50), injury concerns at Bama (21:07) and more. Ivan Maisel and Ryan McGee remember the members of the college football community who were lost over the course of the past year. Kevin Winter is joined by 7 college football experts, including Mel Kiper Jr., Paul Finebaum, Brad Edwards, Booger McFarland, and more, who deliver their unique perspectives and predictions of the Rose and Sugar Bowls. Peter Burns, Adam Rittenberg and Jake Trotter discuss early signing developments (3:10), teams with the most and least regrets this season (12:27), the start of bowl mania (23:50) and more. Ivan Maisel, Adam Rittenberg and Brad Edwards discuss Shea Patterson's potential impact on Michigan (3:05), the significance of Sonny Dykes at SMU (10:51) and more. Plus, a conversation about the ESPN All-America team (24:48). Ivan Maisel, Ryan McGee and Chris Low discuss a classic Army-Navy game (3:21), Baker Mayfield's Heisman legacy (10:51), Oregon's hire of Mario Cristobal (23:31) and more. After chatting with Phil Steele about CFB awards, Army-Navy and the FCS playoffs (2:02), Brad Edwards, Jake Trotter and Chris Low answer dozens of #Walkons questions on a variety of topics (17:32). Ivan Maisel, Adam Rittenberg and Jake Trotter discuss Tennessee finally getting its man (3:30), debate if there's any awards drama (20:23) and more. Peter Burns, Brad Edwards and Adam Rittenberg discuss the latest coaching hires (1:58), debate the best and worst hires on this year's carousel (28:55) and much more. Peter Burns, Brad Edwards and Chris Low discuss this year's Heisman finalists (2:57), weigh in on the Jimbo and Herm introductions (7:30), react to UCF hiring Josh Heupel (19:43) and much more. Matt Schick, Ivan Maisel and Ryan McGee react to the CFP selections (3:19), discuss the latest coaching news (26:33) and more. Plus, another edition of "Talk Nerdy To Me" (42:45). Ivan Maisel and Ryan McGee look back at the historic 1997 Heisman class and chat about the memorable season with Heisman winner Charles Woodson (10:21) and finalist Randy Moss (29:47). Rece Davis, Kirk Herbstreit, Joey Galloway, Jesse Palmer and Booger McFarland recap the unveiling of the CFP Top 25 including the Top 4 of Clemson, Oklahoma, Georgia and Alabama, debate if the committee had it right selecting Alabama over Big10 Champ Ohio State and more. Also, Kirby Hocutt, Dabo Swinney, Kirby Smart, Lincoln Riley and Nick Saban join the show. Matt Schick, Ryan McGee and Jake Trotter discuss another wild turn of events at UT (3:18), penalties for Ole Miss (15:48) and more. Plus, they preview championship weekend (21:36) and get Talked Nerdy to by Brad Edwards and Seth Walder (45:43). Matt Schick, Adam Rittenberg and Jake Trotter examine the latest coaching drama (2:00), look ahead to the weekend slate (19:39), resurrect the confidence meter (32:36) and more. Plus, Phil Steele's weekly visit (38:34). Ivan Maisel, Peter Burns and Brad Edwards react to the penultimate Playoff rankings (2:30), begin to look ahead to championship weekend (20:05), examine the latest coaching news (25:53) and more. Ivan Maisel, Adam Rittenberg and Chris Low discuss more coaching developments across the country (2:55), forecast the CFP rankings (25:45) and more. Plus, another edition of "Talk Nerdy To Me" with Brad Edwards and Matt Morris (29:50). Ryan McGee, Matt Schick and Heather Dinich discuss the mess at Tennessee with Chris Low (2:25). Plus, they weigh in on the rest of the coaching carousel (19:58), how the weekend impacted the CFP picture (27:02) and much more. Matt Barrie and Paul Finebaum recap the Iron Bowl and its implications for the CFP (2:50), Ohio State's comeback win over Michigan (18:50), the guys give you a ride on the coaching carousel (19:30) and Eric LeGrand stops by to talk about the Iron Bowl, the weekend in CFB and what to make of the CFP Rankings for this week. Ivan Maisel, Peter Burns and Jake Trotter react to the latest CFP rankings (2:15), address the rumors surrounding Kevin Sumlin (7:11), preview the weekend (25:05) and more. Plus, an early visit from Phil Steele (31:26). Ryan McGee, Adam Rittenberg and Brad Edwards discuss how the Baker Mayfield situation could impact Oklahoma on the field (3:30), discuss the best first-year head coaches (26:07) and much more. Adam Rittenberg, Chris Low and Mark Schlabach discuss the coaching vacancies in college football and break down the most likely candidates to fill the slots. Matt Barrie and Paul Finebaum recap Week 12 of CFB including Baker Mayfield's inappropriate gesture vs Kansas (2:00) Wisconsin cruising past Michigan (8:50), the guys take you behind the curtain on the latest coaching rumors (22:30) and Eric LeGrand stops by to talk about Jim Harbaugh, the weekend in CFB and his Iron Bowl prediction. Peter Burns, Adam Rittenberg and Chris Low discuss Wisconsin-Michigan and other matchups that stand out this weekend, Lane Kiffin's impact at FAU, the Tennessee and Florida coaching jobs and more. Ivan Maisel, Heather Dinich and Jake Trotter explain why even though the Week 12 slate looks weak, there are plenty of major implications (2:55). Plus, Phil Steele with his weekly picks (22:18). Ryan McGee, Adam Rittenberg and Brad Edwards voice their confusion over the latest CFP rankings (1:30), react to Arkansas parting ways with Jeff Long (18:35) and much more. Peter Burns, Heather Dinich and Matt Schick preview the next CFP rankings (3:00), discuss some worthy COY candidates (22:02) and more. Plus, a chat with Austin Peay coach Will Healy (26:07). Matt Barrie and Paul Finebaum recap Week 11 of CFB including Miami dominating Notre Dame (2:50) huge shakeups in the Top 5, are people's opinions changing on Oklahoma (7:50), the guys give their CFP Rankings (15:30) and Eric LeGrand stops by to talk about Miami's defense, the weekend in CFB and his CFP Rankings. Breaking free from the Notre Dame-Miami hype train, Ivan Maisel, Ryan McGee and Jake Trotter examine the other big games in Week 11 which carry the most weight (4:00). Plus, another edition of "Talk Nerdy To Me" (26:00). Peter Burns, Ryan McGee and Jake Trotter discuss the best aspects of the old-school Miami/Notre Dame rivalry (3:30), weigh in on the grass not being greener in the SEC (9:17) and more. Plus, the Thursday confidence meter (20:41) and Phil Steele's picks (30:48). Matt Schick, Heather Dinich and Brad Edwards react to the latest Playoff rankings (2:15), discuss how Notre Dame ends up fitting in (20:49) and more. Plus, how several realistic scenarios could shape the final Playoff picture (29:29). Before chatting with West Virginia coach Dana Holgorsen (29:24), Ivan Maisel, Adam Rittenberg and Chris Low discuss whether Miami or Wisconsin could put up a fight in the CFP (7:34), debate which program will make the most progress next year (12:29) and more. Matt Schick, Ryan McGee and Chris Low discuss the precarious position of the Big Ten (3:58), Bedlam living up to the hype (15:53), Miami's big win (30:40) and more. Plus, "Talk Nerdy To Me" tries to make sense of the metrics (40:26). On the Sunday edition of Campus Conversation, Matt Barrie and Paul Finebaum recap Week 10 of CFB including Ohio State getting blown out by Iowa (3:45), Miami and Wisconsin remaining undefeated (12:45), the offensive explosion in Bedlam (9:00) and former Rutgers DT Eric LeGrand stops by to talk about Ohio State, Bedlam and his pick for Miami vs Notre Dame. Ivan Maisel, Brad Edwards and Jake Trotter react to the first CFP rankings (2:15), discuss what can be taken from them and more. Plus, BC coach Steve Addazio (27:01) and Northwestern QB Clayton Thorson stop by (38:45). Ivan Maisel, Adam Rittenberg and Chris Low discuss who will be in the initial top-4, debate which teams truly control their own destiny and more (3:00). Plus, they weigh in on Mark Emmert's revealing commentary about the state of the NCAA (28:15). 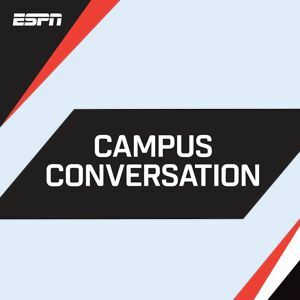 On the Sunday edition of Campus Conversation, Matt Barrie and Paul Finebaum recap Week 9 of CFB including #6 Ohio State erasing an 18-point deficit to upset #2 Penn State (2:00), the big picture for coaches in CFB (17:30), the guys give their CFP Rankings (15:30) and former Rutgers DT Eric LeGrand stops by to talk about Ohio State and his CFP rankings. Ryan McGee, Heather Dinich and Adam Rittenberg discuss the impact of Stanford's close call (3:04), why Georgia can't be haunted by cocktail parties past (13:34), the real importance of the last weekend before the first Playoff rankings (19:54) and more. Matt Schick, Ivan Maisel and Ryan McGee discuss which teams pass the ever-ambiguous "eye test" (18:29) hop on the confidence meter (22:55) and more. Plus, Phil Steele (31:40). Before conversations with former Missouri coach Gary Pinkel (25:25) and Rutgers QB Gio Rescigno (37:39), Ivan Maisel, Brad Edwards and Jake Trotter talk revenge for Penn State-Ohio State (4:00), debate true blue bloods (15:24) and more. Before a conversation with 1996 Heisman winner Danny Wuerffel (24:47), Ryan McGee, Chris Low and Jake Trotter discuss threats against Florida (2:04), Sam Darnold's decision about his future (8:27), Notre Dame's Playoff hopes (12:21) and more. Matt Schick, Adam Rittenberg and Chris Low discuss which teams we learned the most about in Week 8 (4:02), play the CFP "what if" game (32:13) and more. Plus, a fresh edition of "Talk Nerdy To Me" (40:06). On the Sunday edition of Campus Conversation, Matt Barrie and Paul Finebaum recap Week 8 of CFB including the Penn State beatdown of Michigan, ND rolling over USC, they talk the big picture of CFB and former Rutgers DT Eric LeGrand stops by to talk about Penn State, Notre Dame and Miami. Matt Schick, Peter Burns and Ryan McGee discuss James Franklin's approach to Michigan (11:40), whether Wisconsin is legit (20:51), get on the confidence meter (32:36) and more. Plus, Phil Steele stops by to preview the week's biggest games (45:10). Before catching up with West Virginia's Will Grier (27:20) and Syracuse's Steve Ishmael (37:03), Ivan Maisel, Adam Rittenberg and Brad Edwards discuss potential concerns at Auburn (3:20), what's on the line in South Bend this weekend (10:30) and more. Peter Burns, Heather Dinich and Jake Trotter discuss who should be the most sorry through the first 7 weeks of the season (1:52). Plus, they debate the scenarios the rest of the way which could cause complete Playoff chaos (14:06). Matt Schick, Adam Rittenberg and Ryan McGee discuss how Week 7's stunning upsets re-shaped the landscape (13:48), Nebraska's new AD (4:31) and much more. Plus, another edition of "Talk Nerdy To Me" with Brad Edwards (41:12). On the Sunday edition of Campus Conversation, Matt Barrie and Paul Finebaum recap Week 7 of CFB including all of the upsets in the Top 10, the guys pick the Playoff 4 as they see it, talk big picture of CFB and former Rutgers DT Eric LeGrand stops by to talk about Clemson and Ohio State. After an update on UNC from Ryan McGee (1:57), Peter Burns, Matt Schick and Heather Dinich discuss who runs the biggest risk of being this week's version of Oklahoma (14:34) and much more. Plus, another edition of "Talk Nerdy To Me" focusing on Miami's conference title hopes (43:17). Matt Schick, Peter Burns and Chris Low discuss the coaches that have best resurrected their seasons (5:43), check in with great American orator Mike Leach (16:09) and more. Plus, the confidence meter (34:00) and Phil Steele's weekly visit (45:30). Before a conversation with Iowa State WR Allen Lazard (28:53), Peter Burns, Ivan Maisel and Brad Edwards discuss their impressions from the first half of the season, including their biggest surprises, disappointments and more.